Load up your family and head on out to your favorite campground with this Wildwood X-Lite 201BHXL travel trailer. Your kids can have their own sleeping space at the rear bunk beds while mom and dad can have the Murphy Bed. During the day after the bed is put away then you can easily set up the sofa for a nice front living area. 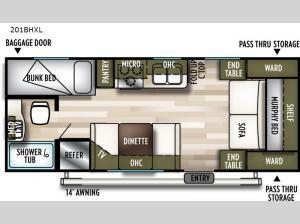 With the convenience of the rear bathroom now you won't have to use the campground facilities. 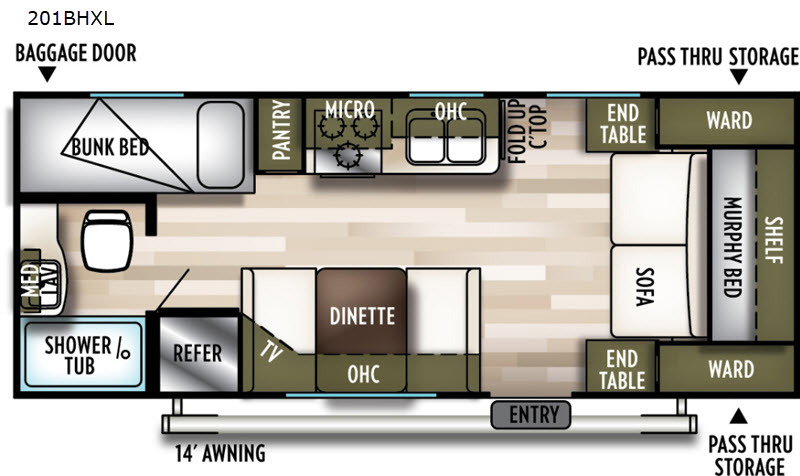 The 14' awning provides plenty of shade during the day and helps to maximize your outdoor living space and more! Modern Trailer is not responsible for any misprints, typos, or errors found in our website pages. Any price listed excludes sales tax, registration tags, and delivery fees. Manufacturer pictures, specifications, and features may be used in place of actual units on our lot. Please contact us @765-644-4497 for availability as our inventory changes rapidly. All calculated payments are an estimate only and do not constitute a commitment that financing or a specific interest rate or term is available.